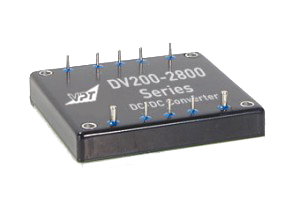 DV200-2800D DC-DC Converter | VPT, Inc. Select the DV200 for use in high-end military and aerospace applications, such as ruggedized laptop computers, ground-based weapons systems, and other demanding applications. The DV200 incorporates VPT’s patented magnetic feedback technology, which eliminates the use of optocouplers in the unit and boosts product performance in slow start-up situations. Additionally, the DV200 offers the highest power density available today for military applications in the half-brick size, due to direct bond copper and additional specialized thermal design techniques. Electrical performance at Tcase = -55°C to +100°C, Vin = +270V ± 5%, full load, unless otherwise specified.